Greetings and welcome to Spin the Black Circle. 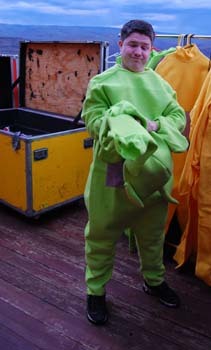 My name is Travis Hay (That’s me on the right putting on the green Teletubby costume.) and I’ll be your host for what I hope will become a great destination for just about any type of musical tidbit you’re looking on the Internet. From news on the latest over-hyped buzz band to album reviews, artist interviews and news on the local scene, you’ll find it here. Some of you may already know me from another local music blog I operate called Ear Candy. Over there I’ve been able to share all sorts of music news nuggets, features and insider info with readers. I hope to do the same for the readers of the Kitsap Sun with this blog. You see, I think I have the best job in the world and I enjoy sharing it with others. As a music journalist covering the Seattle music scene for the past seven years I have been fortunate enough to have the opportunities to do some amazing things. I’ve danced on stage with the Flaming Lips, hung out at a hootenanny with Weezer and interviewed Chris Cornell while he was doing vocal warm ups on his tour bus. Like I said, it’s the best job in the world and I’m really looking forward to sharing my experiences with you through Spin the Black Circle. • Insightful and intelligent commentary on the musical climate. • Promotion of an open discourse about all things music. • Honest and straightforward reviews of albums, concerts and other music-related tidbits. • Criticism and praise of the national, international and local music press. I feel lucky to have another outlet to spread my musical knowledge throughout the blogosphere and I hope you visit regularly and enjoy what you find here.